While Rush’s Synth Era had brought life to some of the band’s most eclectic and esoteric music, the band was already beginning to get tired of playing it live by the tour behind “Hold Your Fire”. Technology wasn’t what it was now, and running a big show with lots of synthesizers and samples required huge computer banks that were subject to frequent breakdowns. Geddy Lee frequently found himself bolted to his keyboard stand on his side of the stage, and balancing lead vocals, bass, keyboards, samples, and his synth pedals became too much for him. Not to mention Alex Lifeson was getting tired of his guitar getting relegated to the background, so big changes were in order on the follow-up to “Hold Your Fire”. Things weren’t so cut-and-dry when entering this new era though, and perhaps they never were. People enjoy cutting off Rush’s catalog into four album segments because, back in the day, they’d always release a live album after four albums. But really, certain albums come in pairs, with the latter usually extrapolating on what the previous album had tried to do. “Permanent Waves” and “Moving Pictures” are of a kind. “Power Windows” and “Hold Your Fire” are of a kind. In this respect, “Presto” and its successor “Roll The Bones” are of a kind. They represented the band gradually moving away from keyboards, before the quantum leap back to guitars that would happen with “Counterparts” and “Test For Echo”. Because Peter Collins was unavailable at the time, Rush decided to bring on Rupert Hine as a producer for this and later for “Roll The Bones”. Hine was best known for producing pop acts at the time, and in those circles most of the emphasis is put on the singer above all else. “Roll The Bones” would later veer more towards guitar like the band had been hoping for, but “Presto” is unique amongst Rush albums in that it focuses on Geddy’s voices and Neil’s lyrics all throughout. This would be the closest Rush would get to singer/songwriter material in their entire catalog. That’s not to say there’s not impressive musicianship throughout “Presto”, though. The opener, “Show Don’t Tell”, has tons of musical and tonal changes all through its five minute length, sounding almost like percussive gymnastics as it continues. It’s simultaneously funky and haunting, moving from wild guitars and drums to insistent pianos and layered vocals. It throws down the gauntlet early, showing that this is Rush getting weird, and not caring what genre they fit into this time. Rather than both instruments vying for attention, guitars and keyboards often come together on “Presto”, combining for one bright, effervescent chord. The opening for “Chain Lightning” shows that before getting to its grind in the verses. This is an album that’s simultaneously beautiful, yet harsh. Next up is “The Pass”, a song Rush feels is one of their most important, and I’m inclined to agree. Rush has written at great length about their admiration of the individual who won’t let others curb him or her, something I’ve complimented quite often in these reviews. “The Pass”, however, shows the flip side of that coin. It sings about a Tom Sawyer-esque character whose individuality has gotten him nothing but grief, and he’s reached the end of his rope with consideration of suicide. I’ve heard plenty of anti-suicide songs, and they all seem extremely mopey or pleading, to the point where you can’t take them seriously. “The Pass” is different though. “The Pass” is gentle and understanding, and it takes the view of someone who’s been in that dark position before and wants to help you. Easily one of the band’s all-time best. “War Paint” is a bit of a weak link for me on this album. The composition isn’t bad, but it seems every album has that one song where Neil stretches the metaphor just a bit too far and he does himself a disservice as a lyricist. In this case, he makes it seems like the clothes and make-up teens wear while going out is like war paint, symbolizes a youthful war of the sexes. Lines like “Paint the night with battle cries” and “The mirror always lies” are just too cheesy for me and I can’t take them seriously. Many people are surprised to find the bassline on “Scars” is a sequenced keyboard, but I find this more organic and evocative than some of the sequenced bits on “Power Windows” and “Hold Your Fire” (without putting either of those albums down). The percussion is some of the tightest, and the guitars roar from the sidelines, rather than taking center stage. This might be the closest Rush gets to dance music, and that makes this a rare, underrated track. The title track of “Presto” was sadly overlooked for many years, but has recently re-emerged in live sets to fans’ delight. While most of the album borders on funk, “Presto” goes back to the band’s folk routes on “Fly By Night”, but this time peppering it with the shimmering gloss they acquired during the Synth Era. With it’s heavenly, soaring tone, it feels like a successor to “Mission”, talking more in broadly spiritual matters than any specific faith. And perhaps it has a wink to some of Rush’s fans about their tonal changes saying “Don’t ask me/I’m just improvising”. “Superconductor” is more hard funk that what we’ve seen so far, with the keyboard gloss coming in for the choruses. The lyrics seem to extrapolate on ideas set forth in “The Pass”. While “The Pass” warned the individual not to give into the darkness of loneliness, “Superconductor” warns against letting his individuality getting co-opted and turned into “a fad”, thus losing all of its meaning. “Anagram (For Mongo)” is another one of the rare Rush piano-based tunes, and features Alex’s guitar getting grindy again instead of the echoing, chorus based chords he’s favored for so long. The big word I keep thinking of relating to this song is “lush”. The vocal layering on the chorus is gorgeous and it’s perhaps one of my personal favorites from the record. “Red Tide” is where the pianos and the sequencers finally collide. The layered vocals return in the chorus, but we also get some of Geddy’s most stark vocals during the verses. The heavy reverb throughout the album really aid this song, and you really see how much Geddy’s singing voice has developed since Rush’s early records. “Hand Over Fist” has some really strong funky guitar lines, and some strong driving bass from Geddy. The verses are really strong, but the chorus, with “Scissors cut the paper” are a bit weak for me. If not for “War Paint”, this would probably be the weakest song on the record for me. The album closes “Available Light”, a Rush ballad perhaps like no other. While other songs have bordered on ska, reggae, or funk, “Available Light” is perhaps the only one that sounds like jazz. For most of it, it’s nothing but Geddy and his piano, with Neil contributing sharp, stark snare drum, and Alex contributing the odd bluesy guitar line. The chorus sounds more traditionally Rush, but it’s the stark verse that I find myself enjoying the most, simply because there isn’t another Rush song like this one. Geddy’s vocals are particularly heart-breaking on this one, talking about “the way I used to be”. I can’t confirm, because by all reports the band was in good spirits while recording “Presto”, but lyrically the band seemed to be really exploring previous themes they had touched upon, and perhaps were even pondering their place in rock music since the heyday of “Tom Sawyer”. The album feels very gentle and introspective, a mood the band hadn’t really touched on extensively until this point. Rush would later feel “Presto” wasn’t one of their best, and felt “Roll The Bones” would be a better realization of what they were going for. I tend to agree that, yes, overall “Roll The Bones” is better and has more memorable songs. 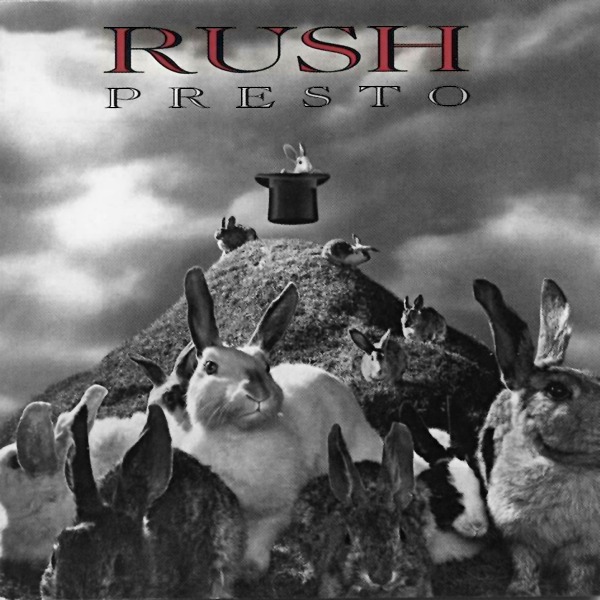 Still, “Presto” occupies a very unique space amongst Rush albums, and while I can’t consider it a classic, I feel it does deserve a second look by fans and the public at large. MY RATING? Very good, but a little short of great.